Rosalinda Guillen, Executive Director of Community to Community, joined us in Washington DC today after being a recipient of the Food Sovereignty Prize, awarded by the US Food Sovereignty Alliance, in Des Moines, Iowa just last week. 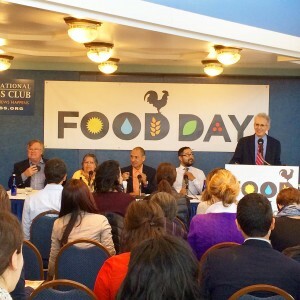 Ms. Guillen spoke at the National Food Day Food Justice Panel, co-sponsored by the Food Chain Workers Alliance . The panel also included Barry Estabrook, writer and author of Tomatoland, co-producer of the new film Food Chains , Jose Oliva, Associate Director of Food Chain Workers Alliance, and Ricardo Salvador from The Union of Concerned Scientists. Please watch Rosalinda’ s speech here . Read More about Rosalinda and Community to Community here.